Toyota's Aygo is a collaborative effort between the Japanese firm and the French PSA Group, which is why you'll see basically identical cars offered from Peugeot and Citroen wearing 107 and C1 badges respectively. Toyota's Aygo is a collaborative effort between the Japanese firm and the French PSA Group, which is why you'll see basically identical cars offered from Peugeot and Citroen wearing 107 and C1 badges respectively. Surprisingly, given the French duo's noted flair, it's actually the Toyota that stands out as the most visually appealing of the triplets, in either three- or five-door guises. Offered in three- and five-door body styles the Aygo competes in the small car class against rivals like Hyundai's i10, the Kia Picanto, Ford Ka and a wealth of other diminutive runabouts. It's small, deliberately so, though space inside isn't as cramped as you'd imagine. The boot is tiny though, and the rear windows in the five-door model don't wind down (they're merely hinged at the front and pop out a fraction at the rear edge), but the Aygo is a charming and enjoyable small car to drive. Briefly offered with a 1.4-litre turbodiesel engine, they're extremely rare, the 1.0-litre petrol unit being the only engine you're ever likely to find in the classifieds. It's a three-cylinder design, which means an off-beat thrum accompanies high revs, but it's actually rather a pleasing sound, and despite its modest 68hp the Aygo feels quite spirited to drive. Trim levels include Aura, Terra and Strata as well as a number of special editions, all being well equipped as standard. Having been around since 2005 it's been updated a couple of times by Toyota, the latest seeing it receive new head- and taillights and some interior improvements. A five-speed manual transmission is standard, but there is an automatic available too, though this not only blunts the Aygo's performance, but also reduces its economy. 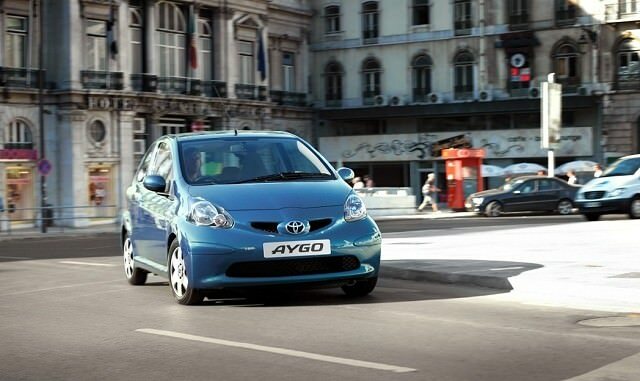 The manual Aygo manages a credible 4.6 litres/100km on the combined consumption cycle. The 1.0-litre petrol model is the only real engine choice, and the manual gearbox is the way to go. Which trim you pick is down to used availability and your budget. If you're not using the rear doors the three-door model is easier to live with, as the front doors are longer, which eases access to the driver and passenger seats. Toyota's smallest offering is enjoyable and charming in equal measure. It might not be vast inside, but decent equipment, good looks inside and out and Toyota build quality and reliability count in its favour. Worth a look if you want an urban runabout.